SLS3: SLS3 limited Hawaiian edition available! SLS3 limited Hawaiian edition available! The NEW SLS3 limited Hawaiian edition is available now. The SOX will be worn by all SLS3 Pros at the Ironman Hawaii this year. We expect to have some Top 10 finishes this year. 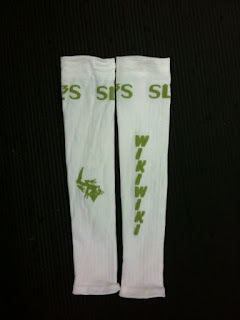 The SOX feature a Hawaiian theme: a green gecko on the front as well as a green logo and the word "wikwiki" on the back. Wiki" pronounced [wiki] or [viki] is a Hawaiian word for "fast". These SOX are very limited - just a few of them have been produced. Make sure you get yours TODAY. The picture features a prototype of the art work on a pair of sleeves.